Mold It could be colored black, brown, yellow or green, and you won't know for certain if it's mold without testing it. Often the northwest corner of a house is known as a "cold corner" and susceptible to developing mold. Efflorescence This condition produces a white or sometimes grayish ash on the walls. Sometimes it sparkles. 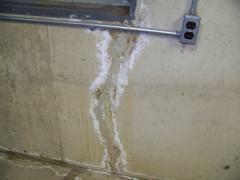 Efflorescence is caused by salt deposits left behind by evapo rating water. Spalling When water gets inside the surface of concrete, brick or stone, salt deposits from the water cause the surface to flake away, peel or pop off. Downspouts. Water problems can be caused by disconnected downspouts or downspouts that aren't long enough to direct water away from the house. Redirect second-floor gutters to separate downspouts. Increase downspout efficiencies by attaching extensions designed to move water downhill. Turn sprinklers away from the house. Install flashing on the roof and under window sills. Re grade the landscaping to slope away from the house. Install French Drains, either under the slab or around the house. Dig a two-foot hole around the perimeter at least six-inches wide. Attach a waterproofing membrane to the house. Lay in four-inch perforated pipe with the holes up. Replace top layer of soil or sod. Install a dehumidifier in the basement. Install a sump pump in the basement, which will pump the water to the street or at least 20 feet away from the foundation. Clean out old mortar and cracks. Cure by daily spritzing the joints with water for the first week. Waterproofing by painting a sealer on the interior walls doesn't really help much if water is putting pressure on the walls. It will eventually leak through. In closing, don't store valuables, photographs, paper documents or anything you care to preserve in a wet basement. Moreover, get an expert's opinion, including an engineer's report, if you can, before you buy a house with a wet basement. It might not be worth the hassle.